Musings on project management: Can you beat a checklist? 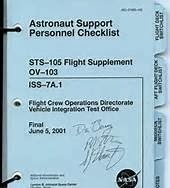 Can anyone image doing serious risk management without a checklist? (The answer, of course, is No ... or, it should be!) Actually, any procedural management can benefit from a checklist. Here's some heresy for the PM tool geeks among us: Many PM tools are great for laying out the schedule, the architecture, and for obtaining estimates -- via simulation -- of likely outcomes, but they are really burdensome at day-to-day management. Why so? In a word, complexity. You can't -- as a practical matter -- put all the dependencies in the tools or the logic would be byzantine. No one could understand or follow it if you put it down (why did you do this? why did you do that?..). Some interactions are best left to the team leader. It's all about situational awareness, look-ahead strategies, and understanding the constituents of getting from here to there. There's no new scope; just go to the scope statement for the parts and go to the schedule for the milestones.